Wrong as it may be, there’s little more exhilarating than successfully lying and bluflng your way through a social deception game, convincing your companions you’re on their side and to be trusted, only to reveal your hidden identity or sabotage their win at the last moment. A number of games we’ve looked at this month play with the idea of fibbing to your friends in diTherent and interesting ways. In Saltlands, allegiances are fluid, with players working together or apart as necessary to survive the arid wasteland. As in so many social deduction games, both Werewords and The C hameleon make words your weapons, as the zoological liars try to mislead or blend in, respectively. In Secrets you may not even be aware which side you’re on until it’s too late and, as in Brutal Kingdom, you must try and use what little knowledge you may have to work out the plans of those around you. 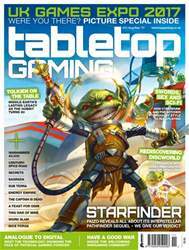 Of course, lying isn’t just about deceiving, and it’s not always a bad thing – Starfinder, as with any RPG, is all about becoming someone you’re not and living out exciting and fulfilling adventures in another universe with your close friends around you. Actually, couldn’t that be said for nearly all tabletop games?